PRO HANGING QB NET - Rae Crowther Co.Rae Crowther Co.
We believe the the Rae Crowther Pro Hanging QB Net is the finest net of its kind on the market. The Crowther Pro Hanging QB Net has more features than any other net of its kind. 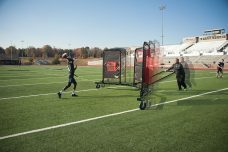 Use the Crowther Pro Hanging QB Net so that your QBs don’t miss throws; so they don’t miss open receivers. Use this net to work on throwing mechanics and vision. Each net has three sewn-in pockets to capture the football. All three of these pockets are sewn at different heights, simulating different routes and catches. All of the pockets have heavy yellow borders sewn into the net to distinguish the pockets and create a durable seam with the netting. Also included with the net are five adjustable targets. 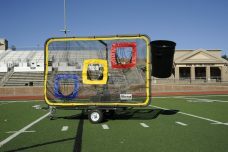 These round targets are all different colors and can be placed anywhere on the net. The circles attach via Velcro. 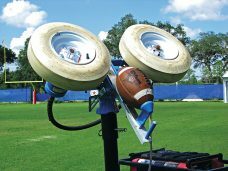 The circles allowing you to adjust the targets for QBs and Snappers. The netting is coated to protect it from the sun and rain. To keep the net in place we sew chain into the bottom hem. This gives the net weight and keeps footballs from skidding away from the net and helps during windy conditions. The size of the net measures 18’6” wide x 12’ high x 60 lbs. 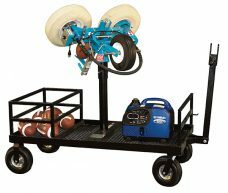 Simple hang the net from your goalpost with Velcro straps. 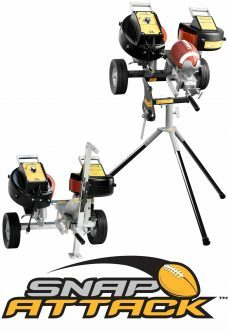 See special deals below when purchasing with other QB items. Warranty 2 years.